Tomorrow’s boardroom is here today! 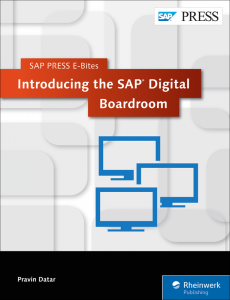 In this E-Bite, learn how to configure your SAP Digital Boardroom with SAP BusinessObjects Cloud. Bring real-time business insight to your boardroom meetings by following along with a business scenario. Use live connection data to enhance the boardroom experience with stories, geospatial charts, and the agenda builder. Take your boardroom to the next level! Discover SAP Digital Boardroom, the next-generation boardroom solution built on SAP BusinessObjects Cloud. Create stories, the core component of SAP BusinessObjects Cloud, using grids, charts, blended data, and more. Build agendas to configure what the viewer sees on the three screens of SAP Digital Boardroom, and learn how to best display data received from SAP BusinessObjects Cloud. Explore line-of-business data with real-time reporting and analytics capabilities, and the various hardware considerations when setting up your own digital boardroom. Discover how to take your meetings to the next level! Pravin Datar is a Senior Director of Product Management for SAP Analytics, responsible for co-innovations and enablement for SAP BusinessObjects Cloud. He has a master’s degree in industrial engineering and business administration, and more than 25 years of experience with ERP, BI and business planning. He has written more than 25 blogs, articles and how-to guides on various SAP analytics topics.